The Chairmaker and Friends is, simply put, a small town boutique specializing in artistry and craftsmanship, through furniture and home decor. Began in 1998 by Garrett Aston, also known as "The Chairmaker," this little shop has created countless pieces of one-of-a-kind furniture from scratch, and rescued an endless number of antique and unique pieces desperately in need of tricky repairs or expert refinishing. Spending the earlier part of his career in the business environment, Aston and his wife decided to make a change, and pursue his passion of chair making. Originally, the shop was dedicated to Early American style furniture, such as primitives and Windsor chairs, and also featured antiques. Aston specialized in creating Windsor chairs using the traditional method of the Early American settlers, and was even featured in Early American living for his work. Over the years, the shop has evolved to include many more styles - but always keeping the original Windsor chairs around, as they fit into every setting! 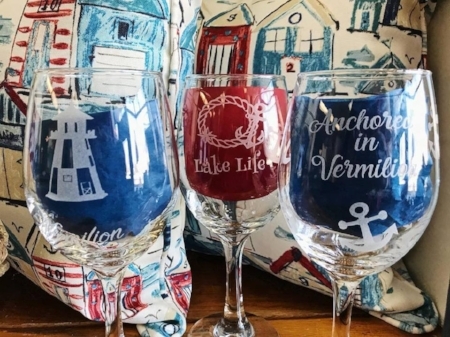 Our gallery in Vermilion features Lakeside, Country French, and English cottage style, along with Farmhouse and primitives. We've expanded to include many local artisans and their lovely home decor. Garrett, along with his dedicated and business-savvy wife Karen, have grown their troop over the years. For a few of these years, Aston has taught his apprentice Kelly, an enthusiastic student of woodworking and Interior Design graduate of the Art Institutes. Together with designer and decor contributor Janet, and business administrator Kathleen, along with countless other local artists, the Chairmaker and Friends has grown to be a diverse, and sometimes surprising, landmark of the Vermilion historic area. Visit more of our Friends!